Weaning – what a minefield! The world of weaning is an absolute minefield! 6 months or before? Smooth or lumps? Purees or baby led weaning? Everyone has a different opinion and god help you if you disagree with them. Oh and don’t even talk to me about the poo! I will admit right now that I am finding weaning extremely stressful. I spent the first 6 months of his life getting to grips with bottle feeding – how to prepare the bottle, how long to leave between feeds, which cry meant ‘feed me now’! I feel like we had just gotten to grips with that when all of a sudden everything changes and we have to add food into the mix! When I first thought about how I was going to wean baby boy I painted an idealistic picture in my head. He would be eating nothing but homemade, organic vegetables and fruits to start off with before moving on to delicious home cooked family meals (smaller portions of course). In preparation I lovingly made a freezer full of vegetable purees ready for that magical 26 week mark when he would be ready for food. Then disaster struck! At 24 weeks he grabbed a piece of garlic bread off my Mum’s plate and started chomping on it! That was not the first meal I had carefully planned and he was 2 weeks too early. Oh well, he obviously wanted food so I thought I would start him on the purees. He hated them! My lovingly prepared, organic purees were not tolerated! What was I doing wrong? My sister in law mentioned that her friend’s child was doing well with baby led weaning so I thought we would give it a try. I sat baby boy in his highchair and placed a variety of vegetables in front of him. He played with them for a while and eventually decided to taste a few. It was more successful than the purees but still not what I had imagined it would be like. After a week of this I was ready to give up and declare that he would just have to drink milk for the rest of his life. It was completely stressing me out. It was at a mother and baby group when I was sat talking to a few other new mums about this subject that I realised that they all felt the same way. It changed my perspective a little bit. Why did I have to stick to just one way of doing things if it didn’t work for us. 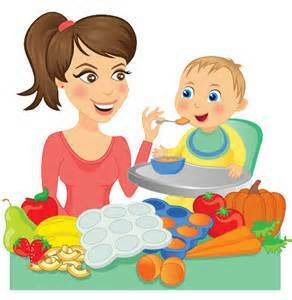 Why couldn’t I mix soft, pureed food with some baby led weaning? Since then we have been experimenting with different foods and I must admit that he will try almost anything. I both spoon feed and let him feed himself, I use purees and finger food, I make him his own meal or mush up a bit of my meal, I home cook and buy pouches (Ella’s Kitchen are a firm favourite). It is a long, drawn out process and I don’t feel that he is doing as well with it as I would like but we just have to keep going. Oh, and I still have a freezer full of purees! Thank you. I’m with you on the constant worrying! I never thought that I would worry so much over such things. I thought that I would be laid back and just go with the flow. I mean it’s just food! I just want to make sure that he is getting the best start in life.